Q1. Is Mayoor School Ajmer a day boarding school? Answer: No. 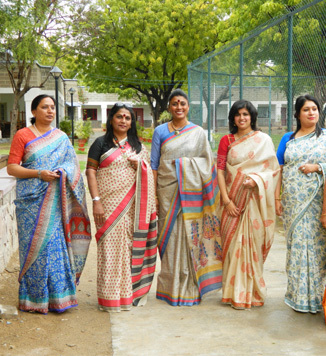 Mayoor School Ajmer is a co-educational day school. However, for sports and other practices students may be required to come during specified timings in the evening. Teachers in-charge are present during the practice sessions for supervision and guidance. Q2. When does the admission process start for nursery and LKG classes? Answer: The admission process for nursery and LKG starts in the first week of January. The forms need to be filled online on the school website. After first week of February the registration process starts. This process involves physical verification of documents and ascertaining whether the child fulfills all eligibility criteria. The next step is deposition of a non-refundable registration fee. A week’s time is given for the deposition of the fee. Please note that registration does not imply admission. Random selection method is adopted for admissions to nursery and LKG classes. Q3. When does the admission procedure start for other classes? Answer: Applications are invited in the month of January. Transfer cases are considered round the year. However, admission is subject to vacancy in the class in which admission is sought. Admission to Science, Commerce or Humanities stream in Class XI is decided strictly in accordance with the school policy which incorporates two important components i.e. meeting the criteria of securing, in Class X Board Examinations, the minimum required percentage for the chosen stream and a personal interview with a panel of subject experts. Q4. What is the admission procedure for all the classes? Answer: Please refer to the Admissions page for the information. Q5. When is the registration form distributed? Answer: For LKG class, once the registration period starts (usually in the first week of January), the registration forms are available on the school website. For other classes, handwritten application should be submitted along with the child’s academic report of the previous year. Q6. What is the mode of submission of registration forms? Answer: The registration forms need to be submitted online. Q7. What is the number of children studying in Mayoor School, Ajmer? Answer: Currently, over 2200 students are enrolled in the school. The maximum number of students per section does not exceed 39. Q8. What is the fee structure at the school? Does the annual fee need to be paid in lump sum or in instalment? Answer: The School fees are paid in two instalments, January and July. If fees are not paid by January 31 and July 31 respectively, the name of the student will be struck off without notice. If re-admission is granted on payment of school dues, a re-admission fee will be charged. The fee schedule is put up on the School Notice Board. All payments can be made online / Offline to HDFC Bank. The school shall not be held responsible for wrong deposition due to incomplete or incorrect entries by parents/guardians. A late fee upto Rs. 100/- will be charged for fee deposited within a fortnight after the last date and it is to be paid along with the fee deposited. Q9.What is the age criteria for admission to nursery and LKG classes? Answer: For admission in Nursery classes, a child must be 3 to 3.5 years old as on 1st April of the new academic year. For admission in LKG, a child must be 3.5 to 4.5 years old as on 1st April of the new academic year. Q 10. What is the curriculum followed at Mayoor School, Ajmer? Answer: The school follows CBSE curriculum. Also, students can opt for CIE Secondary I programme for Classes VI-VIII and IGCSE curriculum for Classes IX and X. Separate sections for classes VI-VIII have been designated for transaction of CIE Curriculum whereas transaction of IGCSE curriculum takes place in CIE Block. Rest of the sections of classes VI-X follow CBSE curriculum. Q 11. What is the minimum % required for admission to Class XI? a) Science with Mathematics : Minimum Aggregate 80% with 80% marks in Mathematics. b) Science without Mathematics : Minimum Aggregate 80% with 70% marks in Mathematics. a) Commerce with Mathematics : Minimum Aggregate 75% with 75% marks in Mathematics. b) Commerce without Mathematics : Minimum Aggregate 75% with 65% marks in Mathematics. a) Humanities with Mathematics : Minimum Aggregate 70% with 75% marks in Mathematics. Q12. What are the subjects offered in Class XI? Q13. What is the admission procedure under the Right to Education (RTE) quota? The parents seeking admission for their ward under the RTE quota need to register on RTE Web Portal and submit an online application. The necessary guidelines and instructions regarding the application procedure are available on the site rte.raj.nic.in . Parents should read the instructions carefully and apply online. Under the offline mode, parents of the wards can obtain RTE forms from the School Reception and submit them at the school reception after filling in the details carefully. Requisite documents also need to be submitted. Q14. Does the school offer scholarship based admissions? Answer: Yes, the school offers scholarship for students who have demonstrated excellence in games, co-curricular and sports. Q15. What sports are offered at the school? Primary School- Athletics, Badminton, Basketball, Chess, Cricket, Cross-country, Handball, Hockey, Soccer, Table Tennis, Tennis, Gymnastics, Softball, Skating, Swimming, Karate. Middle and Senior School- In addition to the above mentioned games and sports, yoga is offered. Q16. Is horse riding facility available inside the school campus? Answer: No, horse riding facility is not available inside the school campus. However, during the summer school, the school arranges for horse riding sessions for the students at the facility in Mayo College, Ajmer. The interested students need to register for horse riding sessions before the summer school commences in the month of May. Q17. Is it mandatory for a student to attend sport practice sessions in the evening? Answer: The sports practice sessions during evening are open to all the students. There is no compulsion as such. However, if a student is a member of a team for any sport, it may be compulsory for him/her to report to the concerned sports teacher in the evening for the practice sessions. Q18. How can a parent know about the holiday schedule? Answer: The holiday schedule is uploaded on the school website and any change is updated. Answer: Please refer to CIE page. Q20. What are the school timings during summers and winters? Saturday will be a holiday for Pre-Primary classes. Every second and fourth Saturday of a month will be a holiday for all Classes. Q21. From where can the school uniform be purchased? Answer: School Uniform is available locally.